Rita Hall has been diagnosed with a rare form of Pulmonary Fibrosis. She may be considered disabled, but she is far from throwing in the towel. Affectionately known to her family and children as “GiGi” (pronounced Gee Gee), her condition has worsened to the point where new lungs are her best option to live a longer life with her family. Rita has always been the first to offer help to friends and family. Whether its a place to stay, or a ride to an appointment, she never hesitates to help. She has 7 grandchildren with an 8th on the way. Her grandchildren are the reason she wants to keep living for years to come. She wants nothing more than to watch her grandchildren grow up. They all love their “GiGi”! Although Rita has health insurance, many costs are not covered. Donations will help with hospital expenses, transportation to and from Boston, medications, post-op recovery and physical therapy costs which will add up quickly. ANY donation helps! 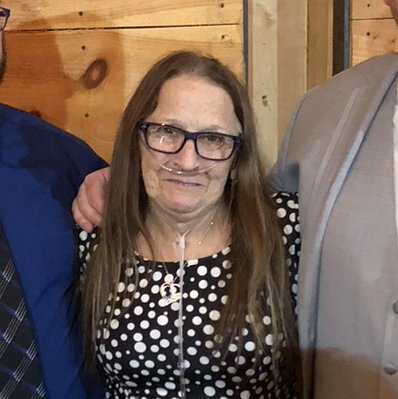 All funds will be donated to Help Hope Live in honor of Rita Hall and will help Rita get through this difficult time so that she is able to live a healthy life alongside her family. This donation is being made on behalf of the Pepsi Taunton team. This donation is being made on behalf of th Pepsi Taunton team. Keep fighting and live your life to the fullest! Thinking of you during the holiday season. Wishing you all the best in the New Year! Sean's coworkers, Deb B., Karen N., Mike P., Andrew S., Ray S. and Janette T.
This donation is being made on behalf of Rhode Island Hospital inpatient pharmacy department. Rita's son Sean is one of our team members. You got this my Bff..prayers and positive thoughts surround you...love you bunches..
Navigant Credit Union is wishing you the best and pulling for you! My sister is the heart of this family. She has 3 wonderful sons and 8 beautiful grandchildren. We all need her to be around for years to come.